OCP Group and Cummins Africa Middle East have announced the signing of a strategic partnership related to the implementation of a Master Rebuild Centre (MRC) for Cummins High Horse Power engines in Khouribga, Morocco. The new facility will serve both North and West Africa, and the scope of the agreement includes the on-site maintenance of the Cummins engines. The facility will be based in the heart of OCP Groups’ Industrial Ecosystem located at Complex Oued Zem Fertiparc in Khouribga. The MRC is expected to be operational by 2021, with an area of 14 000m2 and the capacity to complete 100 engine rebuilds per annum. Johannesburg, 11 February, 2019 – OCP Group and Cummins Africa Middle East have announced the signing of a strategic partnership related to the implementation of a Master Rebuild Centre (MRC) for Cummins High Horse Power engines in Khouribga, Morocco. The new facility will serve both North and West Africa. The scope of the agreement includes on-site maintenance of the Cummins engines. This will be the 16th Master Rebuild Centre for Cummins globally, the 2nd in Africa, and the 1st in the North and West Africa Region. The new facility will be equipped with the latest tools and have state-of-the-art technology. “If it is the most recent, it will be the best”, commented Rachid Ouenniche, Managing Director, Cummins Distribution Africa Middle East. The MRC consists of an industrial platform intended to receive Cummins High Horse Power engines at the end of their lives, which will be brought in from 20 countries in the North and West Africa regions. These engines, once delivered to the MRC, will be completely disassembled and inspected for defective components. They will then be re-assembled using Cummins genuine new or recon parts and tested on an engine dyno in order to ensure that they have reached a new-life performance. The rebuilt engines will be finally returned to customers in the 20 countries in North and West Africa, and guaranteed as new. 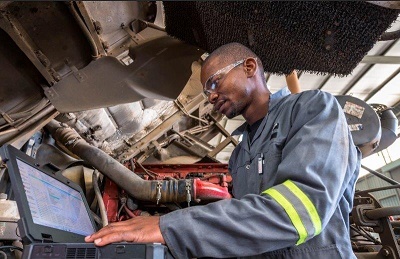 Beyond the optimisation of costs and performance of the targeted engines, this partnership reflects the commitment of OCP Group and Cummins to the socioeconomic development of Africa. “This strategic partnership implements our ‘triple win’ model, which combines improved performances for OCP, best-in-class operations for our partner, and a structural impact for our ecosystem,” said Iliass El Fali, Executive Director Industrial operations, OCP Group. Cummins’ investment in equipment is estimated to be approximately 40 Million Dirhams, and the expected job creation is estimated to be 75 jobs, composed mainly of technicians and engineers. These employees will be recruited locally, and will benefit from Cummins’ inhouse training that focuses on skills transfer and delivering excellent customer support.